Part 1 of this series can be ‘accessed ‘ here. Part 2 of this series can be ‘accessed ‘ here. Part 3 of this series can be ‘accessed ‘ here. Part 4 of this series can be ‘accessed ‘ here. This is the final Part 5. 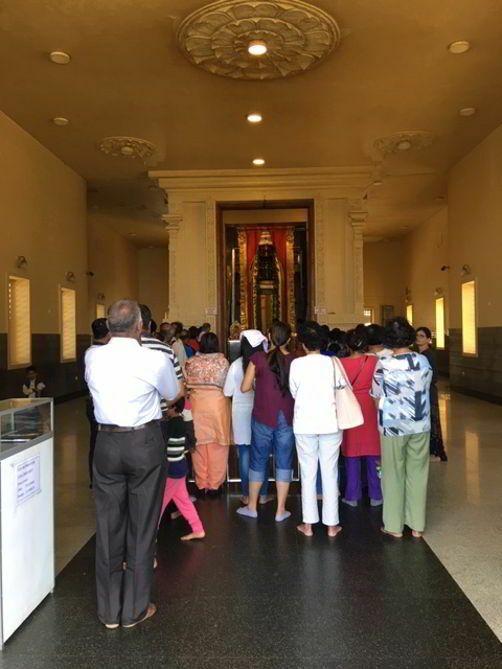 The Shiva Temple Srimuthumariamman, we wanted to make an offering at the old shrine; before Rama set off for Sri Lanka he is thought to have prayed to the Shiva Lingam at Rameswaram. I noticed Sri Lanka has a different approach to the Ramayana, unlike in India where the Ramayana is considered absolute fact. Sri Lanka has made the Ramayana a world of magical realism where history is inextricably fused with legend into one wholesome truth. Rama has many devotees in Sri Lanka, the land of his enemy Ravana. It seems Ravana has the reputation of being a bit of a security expert, the island is reputedly packed with caves and tunnels, impenetrable fortresses and strategic airports, some explored and many unexcavated. One can only admire Sita for her endurance and trust. Our first stop was Sanjeevini Mountain, the source of the sacred herbs that cured Lakshmana of his injury by the hand of Indrajit. Today’s mountain arose from a piece of the Himalayas in Dunagiri, in the Almora District of northern Uttarakhand, dropped by Hanuman from his mountainous load as he searched for the wounded Lakshmana; there are four other mountain sites across the island that originate from Hanuman’s drops of Himalaya. Sanjeevini became the hermitage of Prince Arittha. The pathway to as far as is permitted has been well restored and one must marvel at the thoughtfulness of the original architect of some 2,500 years ago. 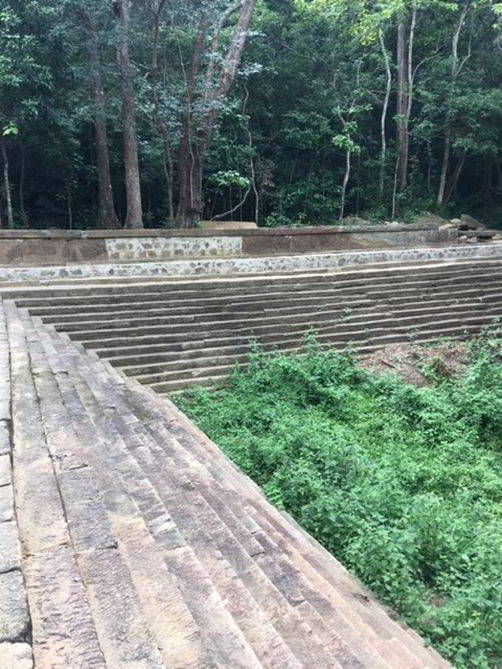 The stepwell/reservoir at the base is a marvel of Anuradhapura period engineering, with two sides man-made stepwell and two sides a natural rock retainer. 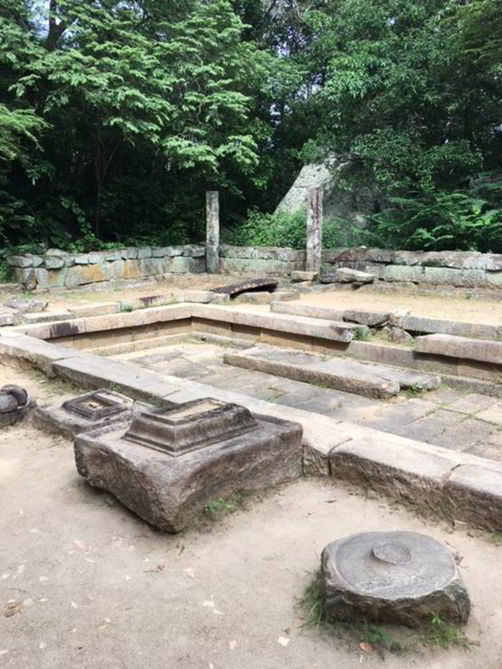 Each time the steps upwards seem to exhaust a meditation platform or the remains of an original Padhanagara, preaching hall or another temple building provides flat relief to catch the breath. Along the way, there are the remains of a large Janthaghara, hospital, with treatment rooms still in evidence. 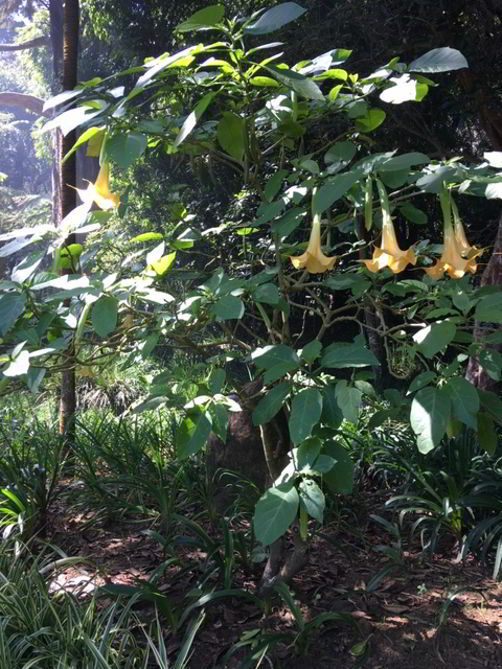 The atmosphere is ethereally peaceful, the forest all around is full of hundreds of medicinal herbs and barks, some examples given were Navahani with which to makes splints for repairing bone breakages, Magosaa to purify the blood, Salacea Riticulata against diabetes, Munamalpothu for gingivitis and concoctions for clearing sinus are among many of the still existing treatments. Buddha came three times to Sanjeevini, first to chair a fight between brothers, then for those affected by the disease, finally to resolve the conflict of the Naga and Yaksha clans. 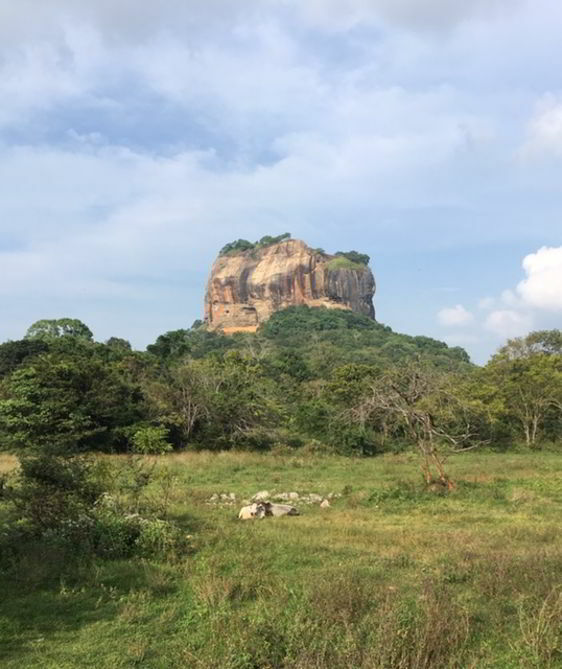 Later we admired Sigiriya from ground level, on the top of this volcanic skyscraper is the palace and citadel that was made by Ravana’s brother King Kubera and later occupied by King Kasyapa. In a sheltered spot halfway up the steep face, I am told of the only surviving Sinhalese frescoes, the “cloud maidens”, dating from the same period of antiquity as the paintings at Ajanta Caves in Maharashtra. Stopping in Matale, at the Shiva Temple Srimuthumariamman, we wanted to make an offering at the old shrine; before Rama set off for Sri Lanka he is thought to have prayed to the Shiva Lingam at Rameswaram. First, my guide, the oracle of my Sri Lankan knowledge Nuwan Gajanayaka, had to vouch that I was a vegetarian before I was allowed in. 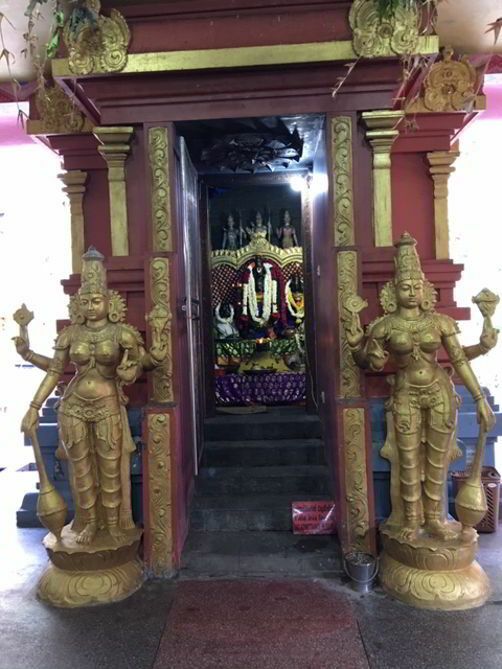 This temple’s newest Gopuram, the Raja Koburum, is famous for its height, splendour and cost, however inside is the lovely smaller original 500-year-old Gopuram and shrine, cleverly open to the sky via a cut out in the ceiling slab of the newer structure. 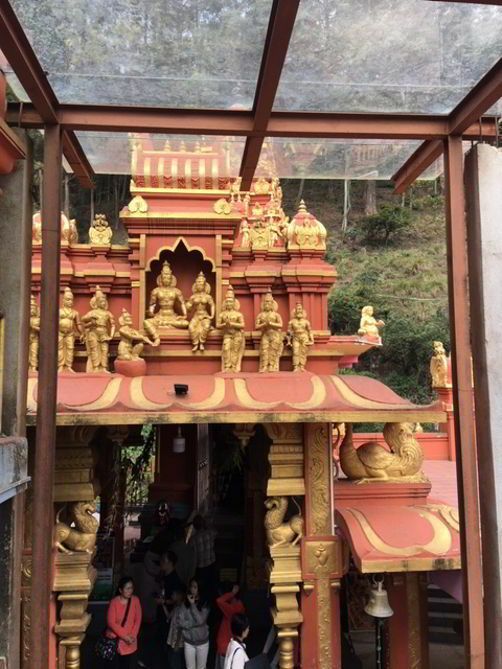 From Kandy we drove to the Chinmaya Mission in Ramboda, arriving here in 1983 Swami Chinmayananda recited the Hanuman Chalisa and received deep vibrations, feeling sure this was were Hanuman had landed in Sri Lanka he was inspired to build a Temple. The land was negotiated with the government and in 1990 construction of the Ashram began, culminating in the opening ceremony in 2001. The Mission’s hamlet is a beautifully landscaped hilltop, presenting an awesome Hanuman Temple with a giant Hanuman idol, testimony to Hanuman being a giant among men and his giant significance in the Ramayana. The Mission at Ramboda does what it says on the tin, to bring to life and into present-day life, the culture and values of Rama, Sita, Lakshmana and Hanuman, for the observance of Dharma. Scholars, pilgrims and tourists are all welcomed, every facility for the long or short stay and study is there. Onwards to the Seetha Amman Khovil/Temple, this is a favourite spot with Indian tourists, up to 10,000 Indian visitors a day come here. 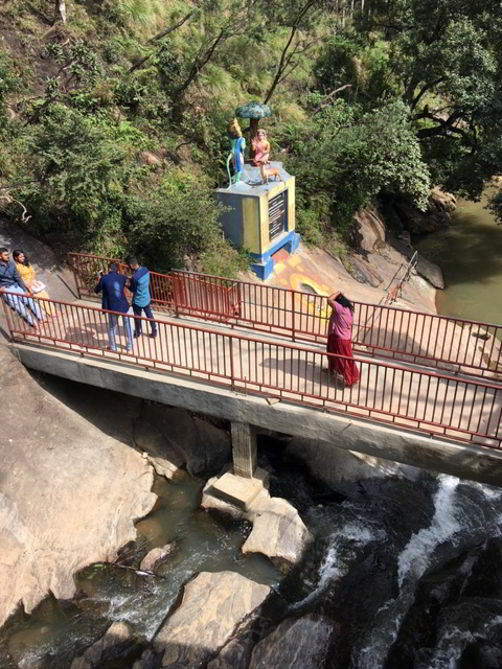 In a perilously steep spot off the main road this temple is the seat of Sita’s lamentation, in the crook of a mountain runs the stream beside which Hanuman’s footprints are embedded in the physical structure of the mountain rock. Inside is a shrine to Ganesha, the original Rama, Sita, Lakshman shrine and a new larger Rama, Sita, Lakshmana shrine. The atmosphere is very sacred, surrounded by the enormous mountains one can get a sense of Sita’s captivity and loss; perhaps the rushing water of the mountain stream symbolised the eventual passing of time, and that may have been of some comfort. 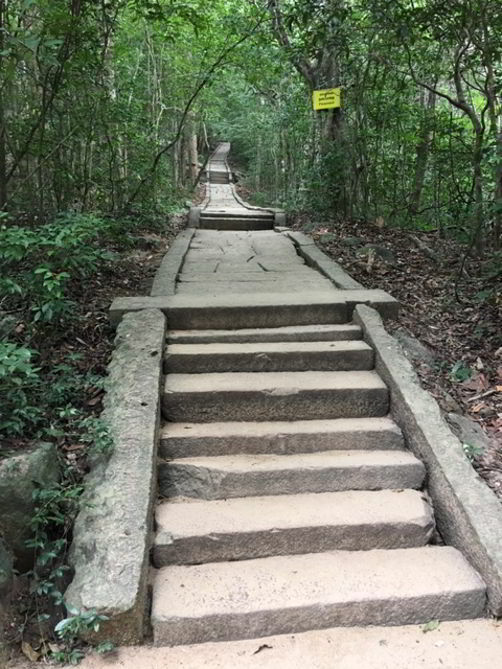 Finally, we went to Ashok Vatika– Ashoka Mal Uyana in Singhalese, a paradisiacal mountainside just beyond the Sita Temple. Sita preferred to live with nature rather than inside Ravana’s palace. 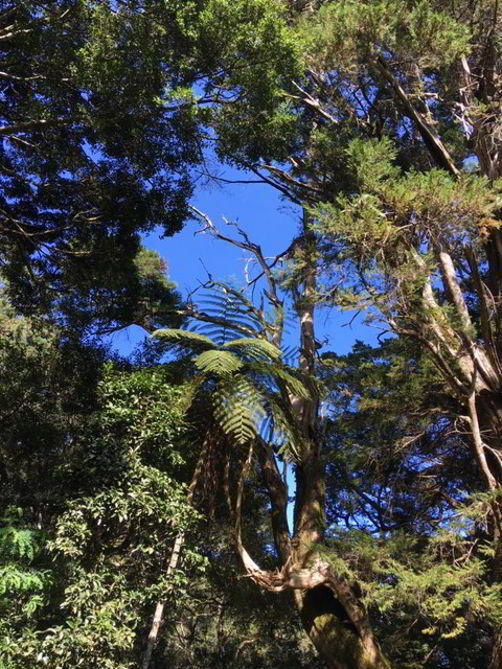 Perhaps this forest reminded her of her time with Rama in Dandakaranya. 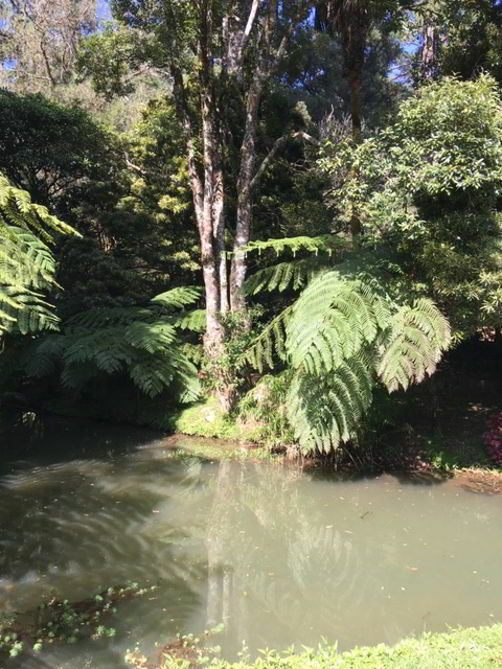 Here too there are mountain streams and ponds, it’s easy to imagine Sita sharing her thoughts and prayers with the birds and animals. Above the botanical gardens cultivated by the British is a wilder forest, once so filled with Ashoka trees that when in bloom from a distance the mountain appeared to be on fire. The forest now has non-native trees introduced by the British grown for railway sleepers, and all the remains of pre-colonial monuments were removed. Mountain leopard still roams the summit but alas the mountain elephants are now extinct. Hanuman started the fire onto the top of Maha Eliya Thenna, now Horton Plains, with the tip of his tail; he wanted to destroy Lanka to revenge Sita’s kidnapping, the soil remains here black and fine as result of the inferno. 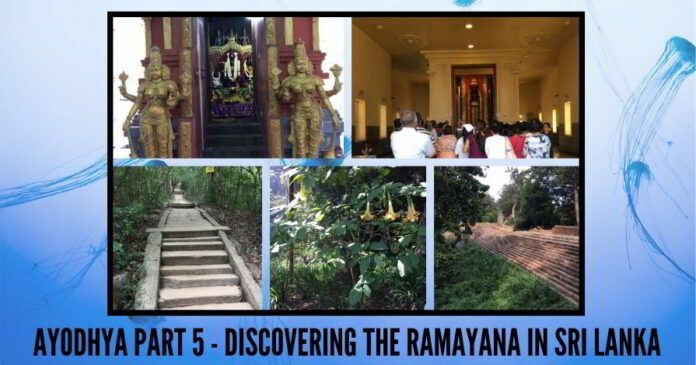 The visual imagery and the spirit of the Ramayana in Sri Lanka is vibrant, added to Rama’s footprints and history in India, it is all just waiting for someone to make a beautiful documentary of his journey.